Mission statement: ‘Never trade your morals for your goals’ guides all we do at Priority One. We believe that those who compromise what they believe in to satisfy their goals will be dissatisfied with their accomplishments. Integrity brings satisfaction to both our clients and our family. Priority One is a privately held company, founded and operated by the same family since 1988. We currently have three generations working together in the nutraceutical industry. We have not lost touch with you the health-care provider, and your patients. We are available to listen to you, and we value your thoughts. Many companies claim quality, but true quality requires continual action. Our full-service CGMP manufacturing facility is certified under 21 CFR Part III. 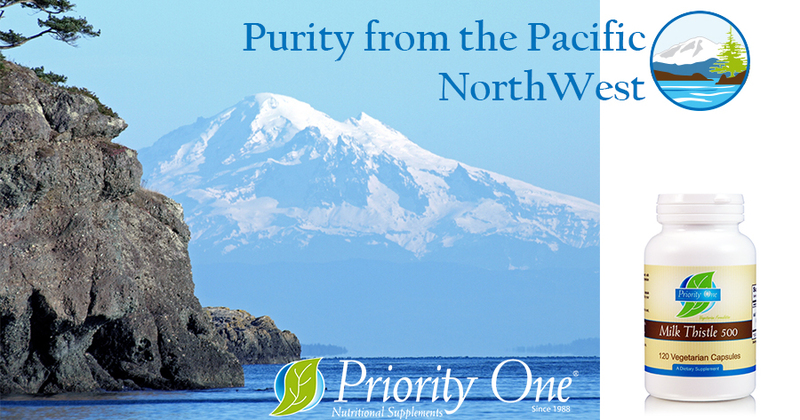 We are a registered facility with the FDA and are certified by the State of Washington for dietary supplement manufacturing. We would also like to note that our manufacturing facility has been approved in over ten countries for dietary supplement manufacturing. Our testing protocols are established utilizing a NSF-designed hazard analysis program. Since every raw material has a unique microbial or environmental adulteration hazard (such as radiation), each material has a predetermined testing protocol suited to its own risk level. Regardless of how low the risk level is determined to be, every raw material is tested using the USP and AHPA recommended standards. Priority One guarantees that all our botanicals are radiation-free. Unlike many of our competitors, we have a standard monitoring program to ensure that no radiation is used in the sterilization of our botanicals. When sterilization is needed, we use a dry-steam technology or other non-destructive technologies. • We conduct 100% testing using USP method 1119 Near-Infrared spectroscopy, a scientific process that uses chemometric models to identify all raw materials. Our reference standards are third-party laboratory-verified, certifying their validity. We have also developed a program utilizing spectroscopy USP method 1119 to establish chemometric models of finished products. These testing models are then used to assure that products meet all intended identity, strength, and composition specifications unique to each finished product batch. Finally, every finished batch is tested again for microbial adulteration, thus assuring that every batch meets the highest purity standards. • We conduct regular audits of our outside laboratory partners and qualify their results eliminating “dry lobbing” dangers. • Environmental testing for microbiological bio-burden hazards is an integral part of the testing program designed by Priority One. Introduction of microbial adulterants during holding or processing is monitored utilizing USP Method 1116 for continued evaluation of microbial limits in controlled areas. This method was adopted by Priority One voluntarily, from the pharmaceutical codes. Dietary supplement regulations do not require this, but we believe it is imperative for quality. • Each finished product is tested again for microbial adulteration as well as the heavy metals; arsenic, cadmium, lead, and mercury. This is done by our hand selected primary third-party laboratory. This laboratory holds the coveted international ISO 17025 certificate. These important steps assure that our products meet the highest purity standards. Next, all compiled information is brought to a classification session. During this session, a review of the documents and ingredients supplied by the potential vendor is conducted. Potential hazards are proposed such as country of origin, economical adulteration potentials, or recent environmental changes to name just a few. After all potential hazards have been agreed upon and classified, the probability of such hazards occurring is determined, using a classification from frequent (1 in 5 purchases) all the way down to extremely unlikely (1 in 10,000 purchases). These are determined by scientific methods, observations, real-life testing protocols, and industry inside knowledge of economically generated adulterations. Last, using the severity and probability, a risk level is determined. Our ingredient mitigations are then determined by risk level. Mitigations describe how a risk level is reduced by the design of our quality systems. Immediate precautions are designed to block hazards in normal conditions. Also included in these mitigations are at least one upstream and one downstream protection to block the hazard from entering the processing chain. These mitigations are ingredient-specific and are added to each ingredient specification sheet, assuring that each time that ingredient is received it is reviewed and tested for its unique hazard(s). All ingredients have risks and require systems to block sources of containments. We do not rely on the supplier for your patient’s safety. Risks such as radiation contamination, heavy metals, E. coli, salmonella, staph, dangerous spores, and economic adulteration are monitored by our rigorous testing methodology. By identifying such risks ahead of time, the mitigation process enables us to block these hazards. In compliance with current CGMP labeling guidelines Priority One has developed a quality assurance labeling team that continually monitors our labels to assure accuracy and full disclosure of all ingredients. Our full disclosure labels give you the confidence that there are no hidden ingredients in our products. CGMP labeling guidelines require all components, including the starting materials of minerals and any excipients from the extraction and standardization process of botanicals to be listed. • In mineral’s, the starting component is listed along with the chelated element. For example many supplements simply list Calcium (chelate). Our full disclosure labels show you the starting component and as well as the chelated element. In the case of our Effervescent Cal-Mag it looks like this: Calcium (as calcium citrate hydroxide carbonate) The carbonate is the mineral in raw mineral form. • If an excipient is used in the raw material processing of botanical extracts these will be listed. Our Quality Control department monitors raw materials for all composition ingredients. Priority One is at the forefront of full label disclosures. Our labels are printed to match an individual lot number and product run. You can have full confidence that if it is in the product it will be listed on the label. We truly care about what is happening in your practice and strive to support you and your patients. Priority One has been pleased to serve you since 1988! We look forward too many more years of providing you with the tools for optimum nutritional health. Good health to you! Purity, Quality and Integrity, this is our Priority!